In the early years of social networks, we could hardly imagine a time when people would be getting fired over their social media posts. Now, a search phrase “fired over a Tweet” returns over 30 million search results on Google, all good examples of what not to post on social media. If you want to avoid getting in trouble with your employer (and we know we want to stay on the good side of our own Ryan Holmes) you should heed these warnings. We have discussed several avoidable risks in What Not To Do and What Not To Do: Part 2. You have shared some more examples of social media faux pas with us in the comments, including brands failing to answer customers’ questions on social channels, or using a questionable branded hashtag without thinking it through. It’s difficult to give an exhaustive list—we would have to update our “What Not To Do” posts on a weekly basis to cover them all, since new examples emerge in the social media feeds and the blogosphere every day. Rather than listing more examples, with this post, we want to offer you a methodology to ensure that your brand doesn’t make an appearance in “Part 3.” To catch potential mistakes before they make it to your social media messaging queue, it’s helpful to set up an editorial process for your posts. You probably have one in place already for your content marketing platform, and those translate easily into social media messaging, and won’t take up too much of your time and effort. 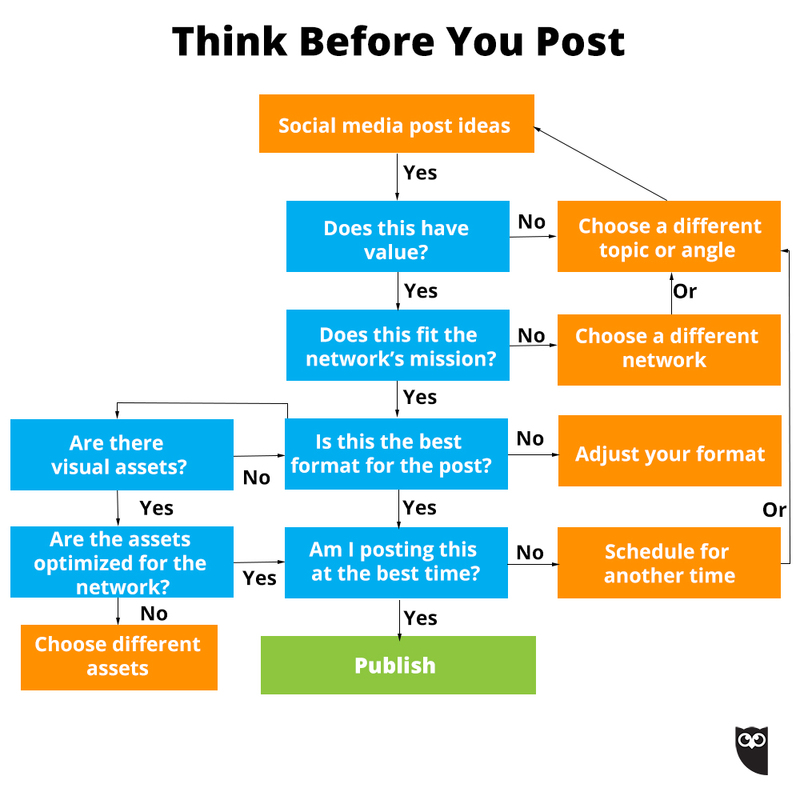 But if you’re unfamiliar with the idea and the process seems intimidating, we have prepared this handy flowchart, along with a list of questions to aid you with the vetting of your social media posts. You already know not to spam your audience with too much content, or fail to meet their expectations with posting too little. You can avoid both pitfalls by making sure the value of the post to the audience is immediately obvious. This is particularly relevant when it comes to retweeting or reposting content from sources outside of your business. Ask yourself why your followers (and not just you, personally) would find the content to be valuable. This can help you catch off-brand content, or posts that don’t align with your target audience. Finally, the question of value for the audience allows you to put a new spin any promotional posts—one that is beneficial not only for boosting the sales of your product, but also demonstrating the subsequent gains for your customers. Is this post contributing to my social network’s mission? Now that you are certain the information adds value and should be shared with your audience, it’s time to decide which channel would be best suited to convey this message. If you have already determined the purpose of each of your brand’s social media profiles, this step is easy: just see which channel’s mission statement best describes the post. If it’s a high-quality picture showing off your colleagues at a fundraising event, it would find its place on Instagram; if one of your writers found a new angle on a current issue, Twitter would be best to join the real-time discussion of that topic. This will ensure that the valuable information for your followers also helps you achieve the business goals you have outlined for your social media channels. Once you’ve chosen the right network for the content of the post, display it in the best way possible. Take a look at the format: are you sticking to the optimal word count? Is it possible to include visual media, such as a high-resolution photo or a Vine video, to better illustrate the information contained in the post? Does my post include hashtags for greater visibility? Adding more assets to your post will not only make it more shareable for your audience, but also increase its value; which, as we have established earlier, is the key factor. To make sure every part of your social media messaging contributes to the overarching goal of your social media strategy, all of its components should be held to the same high standards as the information it conveys. For example, while Tweets with photos give a boost to engagement rates, ask yourself whether the photo will add to the audience’s interest in the post. If you want to invest in social video to increase your presence on channels like YouTube and Facebook, choose subjects that lend themselves to a video explanation, instead of wasting your resources on something that will struggle to get views. We have gone over several ways to find out the best time to Tweet for your brand; if you are in the practice of scheduling your messaging in advance (and you should probably be), follow the posting times that have shown the best results. You should consider factors such as the geographical location and time zones of your primary audience; when your social media channels receive the highest engagement; and having a balanced output across all your channels. However, be mindful of timing: you don’t want to appear insensitive by posting an ill-timed Tweet, as some brands were accused of doing during the 2014 Ferguson unrest. It’s also wise to monitor your competitors, to watch for content that may appear too similar and compete with your messaging. If you’re using a social media management tool, it’s helpful to set up streams to monitor your competitors’ social media accounts in order to adjust the timing of your posts. 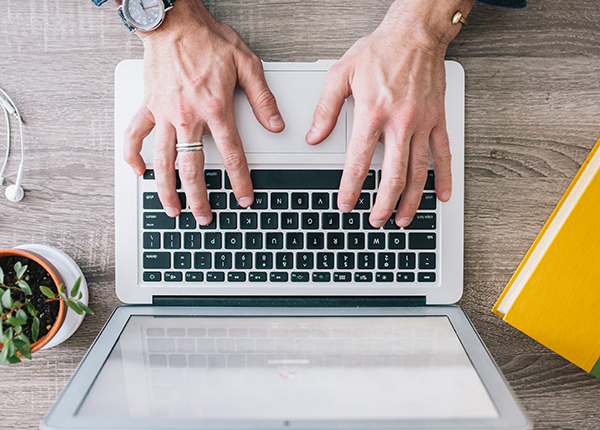 Schedule your social media posts through Hootsuite.